The Preservation Society of Newport is hosting its 18th Newport Flower Show from June 21st to the 23rd at Rosecliff Mansion. This year, the theme is Jade: Eastern Obsessions, which will take attendees on an exotic journey through Far Eastern traditions and beauty. Floral designer Hitomi Gillian will be sharing her skills on the latest techniques and designs while Harriett Henderson will be there to share her experiences throughout the Far East and how Western gardens have been influenced. The weekend kicks off with the Opening Night Cocktail Party held on Friday, June 21st at Rosecliff Mansion. The cocktail party lasts from 6pm to 9pm. Guests can enjoy fresh floral arrangements, “horticultural extravaganzas,” a cocktail buffet and shopping. As you enter the Moon Gate into Rosecliff on Saturday and Sunday, you will be greeted by “zen-full” inspired gardens. There are a variety of events happening throughout the weekend to keep you entertained and enjoying the flower show. 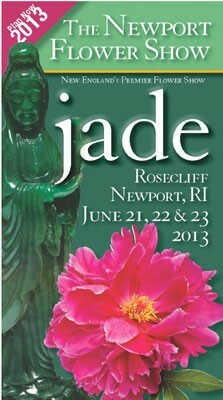 Lectures and Demonstrations will be happening throughout the weekend and will cover topics such as; Chinese Brush Painting, Florals inspired by Far East Traditions, the Spirit of Jade in Newport Landscapes, “Asian Small Bites,” A Tree Tour of the Elms and Chepstow, Jade Garden Plants, and many more. There is also shopping at the Oceanside Boutiques, which is an anticipated Newport tradition. Garden accessories, clothing, gifts, jewelry and decorative items will be available for sale.